Giants in restaurants and real estate are teaming up to create an enclosed food hall the size of a football field in downtown Delray Beach. 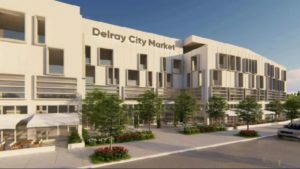 Restaurateur Dennis Max and real estate developer Craig Menin are planning the Delray City Market, a 30,000-square foot food hall at 33 SE Third Ave., half a block south of sizzling Atlantic Avenue. The food hall will be part of a larger building, a 120,000-square-foot, four-story property. About 200 parking spaces on a three-level garage will be in the building, which also will feature a 3,000-square-foot rooftop community garden.